6 Fabulous days in North Carolina! 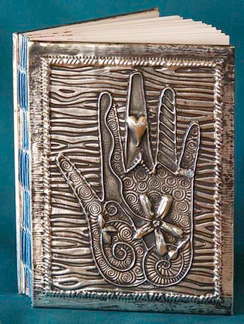 "Repujado" is the Spanish word for the art of metal embossing. Similar to repoussé, metalwork in relief, artists create 3-D images that shine and reflect light beautifully. Using a simple set of hand tools, practice repujado basics on sheets of copper, aluminum, and pewter. As the week progresses, so will your skill set. 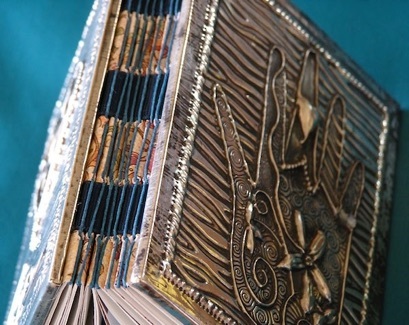 Finish by designing your own journal - a one-of-a-kind, ribbon-bound book with embossed copper or pewter covers. All levels welcome. No children, No pets, Fragrance-free please. Class size is limited to 12 students and your Pre-Paid Registration is required. You may complete your registration and pay for your class with your Credit Card via the John C Campbell Folk School website.